The Interfab White water slide for inground pools has the retro look of the smaller Zoomerang except that it’s higher and is available in both right turn or left turn. 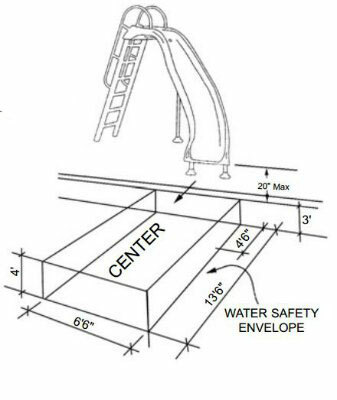 If the features of the smaller (and cheaper) Zoomerang slide is a little bit too constricted, then you might find what you’re looking for in the Interfab White Water pool slide. Customers who have bought the Interfab white Water slide are most happy with the ease of installation and the fun that kids get when on this slide. This slide is durable and lasts for many years. This is one of the best pool slides but without the hefty price tag. The White Water slide stands at only 4′ high making it a great slide for small backyards. It’s also just the right height that you are able to keep your privacy specially when you have a 6′ high fence. The white water pool slide is made of acrylic with fiberglass reinforcements while the deck flanges, handrails and legs are made of stainless steel. The flume has a water system at 15 – 25 gpm which makes sliding down the runway much easier. There are a couple buying options you need to think about before buying the Interfab White water slide. The White water pool slide cost anywhere from $1400 – $1900. The price largely varies depending on the retailer. If you want to buy it at the cheapest price, it’s best to hunt around (although that may take some of your time). Anyway, listed below are some of our site’s sponsors who have some of the best price for these inground pools. Do check them out. A short video on sliding down the white water.